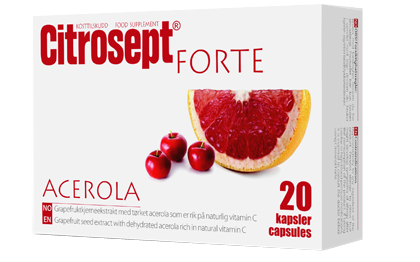 Citrosept Organic is a dietary supplement containing natural bioflavonoids from grapefruit as well as vitamin C, the intake of which is particularly beneficial during the period of increased threat of cold occurrences. Bioflavonoids contained in the daily intake of the product contribute to the proper condition of capillaries. 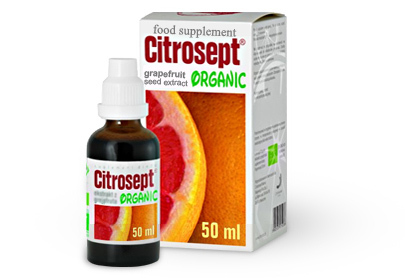 Citrosept Organic is a new, improved formula with significantly milder taste and increased content of grapefruit seed extract in relation to the traditional Citrosept. It is derived from seeds, pulp and white membranes of grapefruit. Its main ingredients include flavonoids contained naturally by fruit and vitamin C.
Usage: 15 drops dissolved in 200 ml of water, three times a day. Do not exceed the recommended daily intake. Supplement your diet with natural grapefruit bioflavonoids and acerola which contains naturally occurring vitamin C, vitamin E and selenium. Recommended dosage: one or two capsules a day with a meal. Do not exceed the recommended dosage. A refreshing and antibacterial gel that supports better hygiene of the mouth and higher comfort. Helps prevent oral discomfort, particularly of those individuals that use dentures and braces. Citrosept Dental soothes irritations of the mucous membrane and helps prevent unpleasant mouth odour. It also helps maintain the normal flora of the mouth cavity. Usage directions: Apply a small amount on your gums and/or the palate after brushing your teeth, do not rinse your mouth and refrain from eating or drinking for 1 hour. Use 3-4 times a day. Avoid contact with eyes. In the event of eye contact, rinse your eyes with plenty of water. If you have an oral infection, the advice of a dentist or doctor should be sought. Ingredients (INCI): Propylene Glycol, Glycerin, Aqua, PVP, Citrus Paradisi, Menthol, Benzalkonium Chloride.